Okay, so maybe this won’t appeal to everyone. I’m an electrical engineer, and IEEE is my professional society. 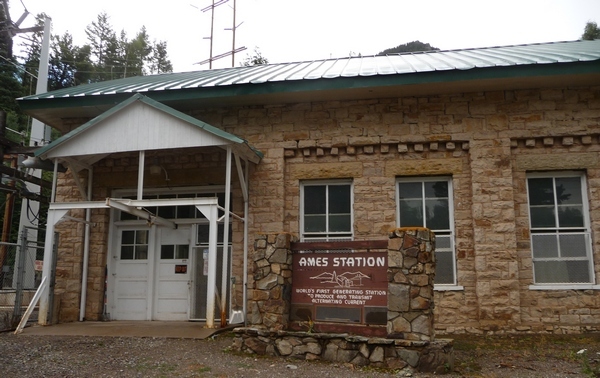 The Ames Station is the first generating station to produce and transmit alternating current (AC) electrical power. We may think that sort of humdrum, but at the time it was hotly-contested technology. It’s located near where Ophir Pass meets the highway at the west end, so I simply had to visit! I set the camera on timer and hopped into the picture. 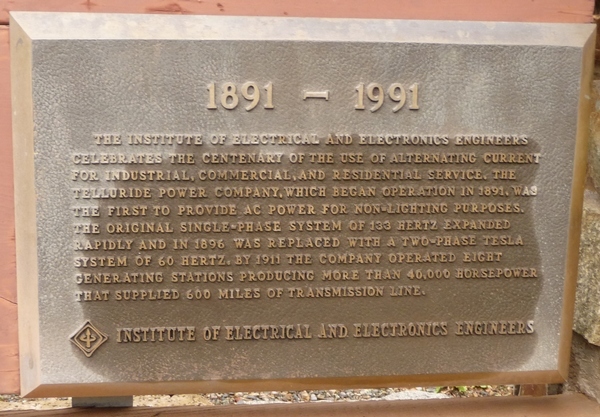 This is an IEEE heritage site, but it's no mere shell. The plant is still very much in operation! Back in the late 1800s electricity was a new thing, so many varieties were invented. Thomas Edison pushed direct current (DC), a relatively low-voltage way to distribute electricity that required thick cables and worked only over limited distances. George Westinghouse, on the other hand, pushed AC, which, at high voltages, can be transmitted over long distances. Well, the war was pretty nasty. 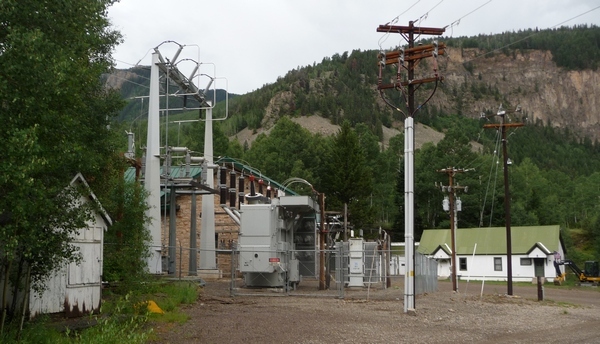 Then came along the Gold King Mine way up on the hillside that needed power. They looked at DC (Edison was an icon even then) but concluded the distance from the hydroelectric power plant (down in the canyon) and the mine (way up on the hillside) was too great, so they used AC. It worked, in fact spectacularly well. This settled the controversy over what kind of generators should be installed at Niagara Falls: AC. Westinghouse got the contract. The rest is history—we use AC everywhere. 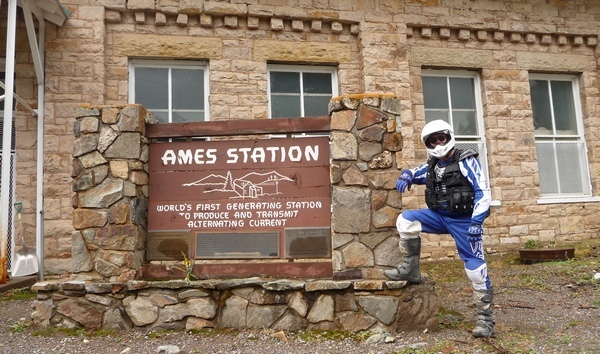 Oh, the Ames hydroelectric plant? It’s still there. And it’s still operating, producing power just as it has for nearly 120 years. I’ve provided a few photographs, including three plaques placed in front of the building. Here's the view from the east. The plant itself is dwarfed behind the huge transformers. This is the power plant itself. Not very big. But it proved that AC is superior to DC and thus makes its mark in history. Here's an explanatory plaque. It looks like something at the bottom was erased. 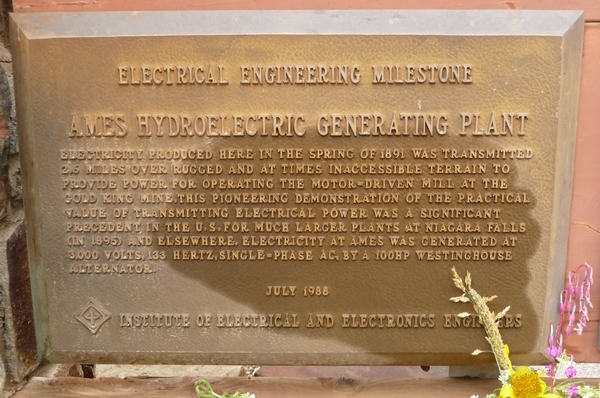 Here's the third and final plaque, put in place on the Ames Plant's hundredth anniversary. This entry was posted in Motorcycling, San Miguel County. Bookmark the permalink. Roger, absolutely right! And more…Tesla’s AC induction motor made AC power useful. In some cases, Tesla kept the patents for awhile and lived on the royalties, but then Westinghouse went through a hard time and asked Tesla to reduce the royalties. Tesla agreed, which led to his financial ruin. However, Westinghouse Corporation paid Tesla’s hotel bill until the day he died–speculation is this is because George Westinghouse felt some lingering guilt. This allowed Tesla to live in some style and eat well, but didn’t fund any further experiments. Tesla is like so many quirky inventors: he did his best work while young. Ames was probably one of the sites Thomas Leggett looked at when he was designing the electrical system for the Standard Mill in Bodie, Calif. (1892). While credit is given to Westinghouse for deployment of AC power, it was Tesla’s designs for transformers that made the system practical. Tesla was a great engineer but a poor businessman and sold his designs outright to Westinghouse. See http://www.explorehistoricalif.com/july09.html for more information about Bodie power.